Woo hoo! I successfully made a zippered tote! If I am to give away my totes to family members, they have to have zippers. They have this fear of being picked by pick pockets, or should the phrase be pick bags/purse?! 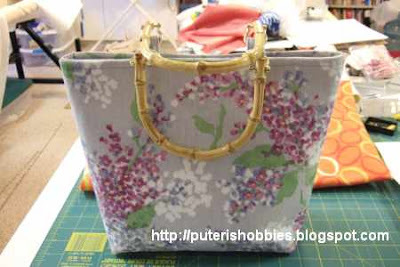 I don't blame them because I will never go shopping carrying a bag that does not have zippers back in Malaysia! 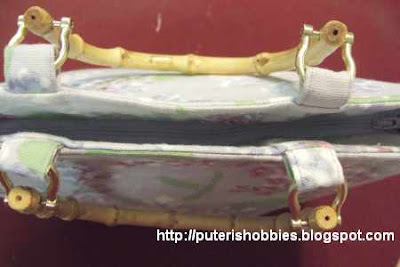 Rattan handles, the same kind as in an earlier tote. I love this tote! Thank you, thank you!! Dah gian begaga ka marik enggau begaga ka beg enggau begaga ka quilt! Craft bukai aku enda minat. Thank you, Kitman! Yes, I have thought about opening an Etsy store. I have looked at what is there, and I guess if it is your lucky day, someone will buy from your store. There are so many people selling the same stuff so it is either you have a following for your products or it happens to be your lucky day and this shopper sees something he/she likes and decides to buy it! I have lots of beaded jewelry that I'd like to sell because I have spent a lot on beads and it is time I started selling some of them!